Telling the Bees is a beautifully written story that has left a forever imprint on my soul. Set in early Orange County, California when orange orchards dotted the landscape. The book tells a story of family, love, mystery and friendship. The author pulls from personal stories and the people who have played a role in her life to write this fascinating story of Albert, the bee keeper. I fell in love with Albert. He reminded me so much of my grandfather. I longed to sit at the table and have toast, honey and tea with him. Albert is kind, quiet and a loner living a simple life. The bees are all Albert seems to care about, but is it? Telling the Bees sucked me in and I didn’t want to put the book down. The characters in this book have depth and stories to tell. I felt like I was sitting on the porch watching the story unfold around me. I was fascinated with the knowledge the author shares in the book about the bees and beekeeping. 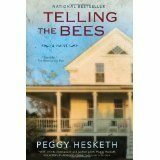 Beekeeping is a science and the author weaves it gently into the story in such a sweet way. I can’t recommend this book enough. I hope you will love it. Please jump back over and leave me a comment once you have read it and let me know your thoughts. Our book club night was incredible. The author joined us for the evening. She is an amazing and incredible woman. The stories she tells of how she developed the story, her research on beekeeping and the unusual coincidences that popped up throughout her writing was fascinating. On a beautiful warm summer evening we cozied into our chairs at a beautifully set table. Our hostess for the evening placed a small jar of local honey at each place setting. Each jar was tied with a simple yellow ribbon around a small honey spoon. The conversation about the book and the characters was enlightening and inspiring.